Cash Flow Forecasting Excel templates provide quick and ready to use Excel templates for preparing cash flow forecasts for the next 120 days ahead, 12 month profit and loss statement and cash flow budgets, 10 year capital budgets as well as sales and productivity budget forecasting. 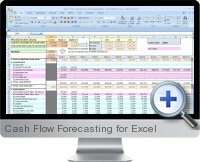 The Excel cash flow forecasting 120 day cash flow plan is simple and easy to prepare and implement. Simply list all payable and receivable cash flow in one Excel table with the expected date of receipt or payment and, with embedded Excel WORKDAY function, the program creates a 120 day by 500 item table that updates daily closing cash balances. The capital plan forecast applies the same list table method process for entering up to 100 capital purchase items, prepares annual forecast and calculates the net present value of the 10 year budget plan.